This view of Ramsgate Harbour from 1802 gives a unique and fascinating glimpse of Ramsgate at the turn of the 19th century. Painted from what was an open, unenclosed east cliff top prior to its enclosure as Albion Place Gardens, the view takes in the Royal Harbour, completed in 1774. The view looks down on the elegant Pier House on the harbour front, designed by Samuel Wyatt in 1794. This building was demolished in the early 1900s as part of a scheme to widen the Harbour Parade. The area of cottages behind was known as Clift Court, while the large red roof maybe part of the either the Oak or the Castle Hotel, two of Ramsgate?s oldest hostelries. Also just visible at end of the furthest West Pier is the original timber staircase called ?Jacob?s Ladder?, built by the carpenter Jacob Steed in 1754 to give access to the harbour works from the cliff top. After falling into disrepair it was replaced by today?s stone staircase in 1826. Above the west cliff, both the Paragon and Nelson?s Crescent, newly completed in 1801, can clearly be seen. Peeping over the hill behind are two of Ramsgate?s three windmills. The two smaller mills were demolished in the mid 1800s with the third surviving until the late 1920s. Only a small area of shops called Windmill Parade is evidence of their location. Finally, the rough path and steps on the far right of the watercolour show the only access to the East Cliff until the Royal Albion Hotel was demolished and Madeira Walk was cut out of the chalk. Smith was born in London, the son of the portraitist and engraver John Raphael Smith (1752-1812). He studied under his father and exhibited at the Royal Academy between 1796 and 1811, mainly portraits but also some watercolours, including views of Reculver, Margate Pier and Brighton in 1802 and 1803. This view of Ramsgate Harbour from 1802 gives a unique and fascinating glimpse of Ramsgate at the turn of the 19th century. Painted from what was an open, unenclosed east cliff top prior to its enclosure as Albion Place Gardens, the view takes in the Royal Harbour, completed in 1774. This is the artist?s on-the-spot sketch from which he made a larger, finished watercolour. 21.3 x 32.1 cm., 8 ? x 12 ? in. Smith was born in London, the son of the portraitist and engraver John Raphael Smith (1752-1812). He exhibited at the Royal Academy between 1796 and 1811, mainly portraits but also views of Reculver, Margate Pier and Brighton. In 1806 he emigrated to the USA and set up successful drawing schools in Boston, New York and Philadelphia. Topographical watercolours by him are in the Library of Congress, the Metropolitan Museum, New York and the National Gallery of Art, Washington. 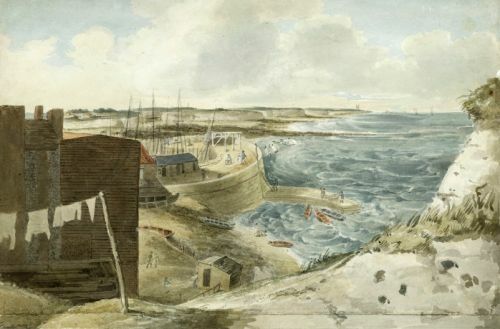 A panorama of Margate Harbour by Smith dated 1803 was with Martyn Gregory (see Huon Mallalieu, The Dictionary of British Watercolour Artists up to 1920, 1979, vol. II, p.512, ill.) and a panorama of Ramsgate was with Guy Peppiatt Fine Art (summer catalogue 2011, no.26).